A year ago I made a video on dividing Agapanthus, a common ornamental plant in most parts of fairly frost-free California. I wanted to know whether a text file or a companion video would climb higher in the rankings. I suspected Google would prioritize on video files, not text, because video is usually more compelling with today’s web. 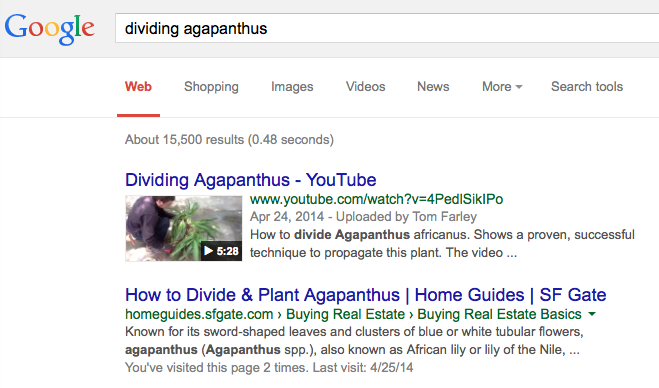 Now, when you enter the phrase “dividing agapanthus” into Google, my video comes up first, before all other text links, as well as those of competing videos. My video has in fact over 5,000 views. My companion text file? Barely a dozen hits. Although lengthy to produce, my suggestion is to explore video first if you want more views of your material. To be fair, I haven’t seen many click throughs from the video to my personal blog, but perhaps if I owned a garden site, not a writer’s site, there would be more reason to click on a link. For more information on this experiment, and to see the video, check out my first blog entry on this subject (internal link). This entry was posted in Uncategorized and tagged Google, video, video files, YouTube video. Bookmark the permalink.